Have you found an online vendor selling Cruzan Black Strap? A soon as you pour it, you can smell the coffee and chocolate notes. Almost like a Reisen candy. It has an oily finish with just a little burn, but leaves behind a bit of sweetness with a taste of toffee. Not a sipper, a bit on the sweet side, but would be good in a punch or mixed drink where you want the flavor to come out. Would make a great pina colada or bushwacker. Honestly, I've only had this in a Dark & Stormy. It smells amazing...to the point where some of my friends believe they should make a cologne out of it. Sheesh, it's hard to say that a black strap rum is smooth, but this one is. We tend to forget about the Cruzan brand, but it offers a solid collection of rums which are the "house" liquor in my home; meaning this is what I serve to guest. Of Cruzan brands, Cruzan Black Strap is unforgettable. If you're looking to drink a Dark & Stormy and you're tired of hearing "Goslings, Goslings", pick up a bottle of Cruzan and enjoy some of those vanilla notes among the ginger beer. Or, even better, pick up a bottle of Kraken for a new kind of Dark & Stormy. It's a sweet maple molasses flavored rum with limited usage. I am a fan of Spanish coffee and I decided to try it with Blackstrap instead of brandy and it was delicious. A good desert coffee or treat. I consider this a desert rum altogether. That being said - I don't compare this with other dark rums as the flavors are apples to oranges. This rum will always have a home on my liquor shelf as its interesting and it changed my coffee drinks. I like it, don't love it. Good rum for mixing smell a lot of molasses in this one plus is a very good value. This is by far my favorite rum!! I have a sweet tooth and you can't beat this rum in sweetness. The most fun you can have with molasses! Buy a bottle, grab some ginger ale and share with your friends. You can't drink this stuff without smiling! Be generous, your pals will appreciate the opportunity to taste such a unique rum! I enjoy this rum with strong hints of vanilla, toasted marshmallow, molasses and nutmeg. I have not tried this rum mixed with soda or juice, as I enjoy sipping this neat. A slight burn going down to let you know your drinking rum, however combined with the right spice nuances, this rum should be a house rum to anyone who enjoys a fine rum. This is a delicious rum heavy with molasses. Many people are put off by it on first taste. But give it a second try and you'll be hooked. Great for the price. Forget Dark & Stormy for a moment. You really must try a Corn 'n' Oil cocktail, which is pretty spectacular, and for that you need black strap rum. Molasses heaven. enjoy the flavors of molasses and maple but not cloyingly sweet. A staple in the cabinet and the price is fantastic too. My first try of this one. There is no way I'd mix it with anything sweet (Coke, ginger ale, etc) as it's very sweet itself. Very strong molasses flavor, it's a smooth rum - I decided to cut that heavy flavor with a bit of seltzer & enjoyed it very much. This stuff is massively underrated. I love keeping this stuff around in the winter time.. It has an amazing molasses flavor and it just makes you feel warm and cozy. This stuff is cloyingly sweet. Reminded me of the maple syrup chug from Super Troopers. We bought this one night at a good price thinking it would be a normal dark rum and could barely drink it. We went straight back out and bought a better bottle. I saved the rum thinking it could be used down the road in a unique mixed drink in lieu of a syrup. It isn't a bad rum, per se, just very sweet and very different. I would give it a lower score but it doesn't seem fair- feels like I'm rating grapefruits in an apple competition. As a fan of Cruzan rums, I decided to give this a try. At first sniff, the aroma of Boston brown bread came to mind. It has a stronger molasses flavor than most other rums but I also noticed hints of anise and vanilla giving this a fairly complex flavor, but it has a bit of a burn. With that said, I like this rum for a change and enjoyed it most on the rocks during my intial four-step tasting. I plan to explore mixers with this too. At about $16 US for a liter in Ohio, I think it's a good buy if this style appeals. I can think of other more expensive dark rums that I don't like as much as this. this rum is very dark, so i use it sparingly in drinks as it can overpower other flavors. But, its strong flavor is perfect for use in desserts or a flavoring. Also works as a base for homemade vanilla. Blackstrap is definitely an a acquired taste if you want to use as more than a topping to mixed drinks. When you finally want to step up and be counted, this is a great partner to have in your cabinet! The flavors roll across your tongue and linger for minutes as they shift from molasses to smoke and leather. It takes fortitude and an appreciation for strong flavors to truly enjoy any blackstrap. But this is the best of the bunch!!! 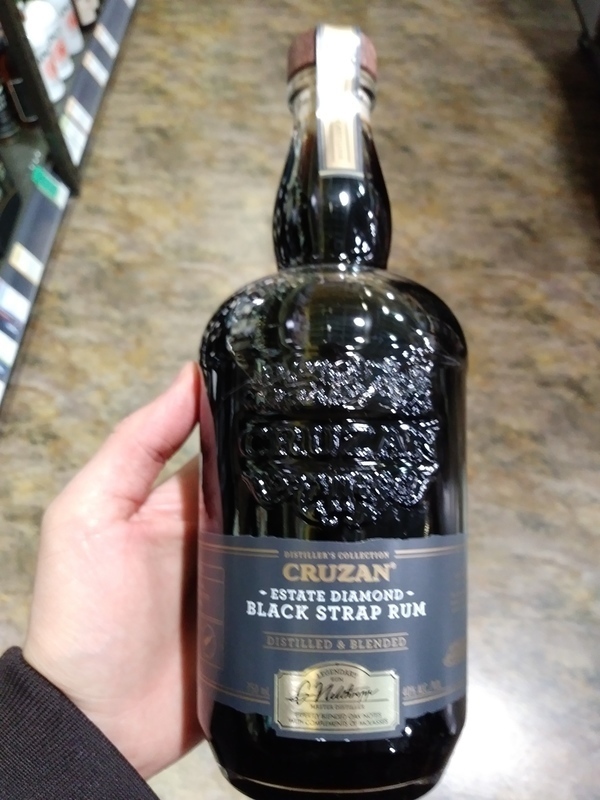 Enjoyed a bottle of Cruzan Black Strap Rum. Very nice bottle and label design. Dark golden color. Oak and pure alcohol to your nose and palate. Strong burn at the end being so dry. Whisky lovers can add 2 points to my score. Darn good value for $20 here in VA . As I expected, semi-rich bodied, with smokey notes of oak, and molasses. I enjoyed it neat or in a dark & stormy. Rum is my drink of choice and I love nothing better than Black Strap with my homemade ginger beer. The richness and darkness of the molasses creates a tasty and fragrant drink that’s unforgettable. Sip it or mix it, it will help you forget the mean woman you married. Incidentally I keep ingredients chilled and never add ice. I hate watery drinks. It's a dark thick rich liquor with plenty of sweetness and butterscotch, however it is overwhelming and not for more then a couple drinks. Deep, dark chocolate flavours littered throughout. Almost like a chilled espresso hot chocolate. Incredibly smooth. Lacks the intensity of other blackstraps. My favourite I've encountered thus far. Taste - dark, rich and deep, molasses, cloves. If I use this in a Jet Pilot, it tastes like a black cherry drink, love it. It will dominate a mixed drink. I could sip this neat.